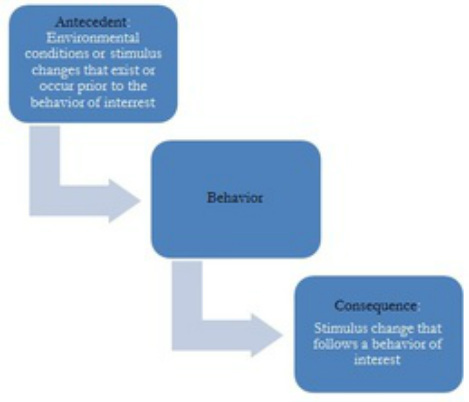 The three-term contingency - also referred to as the ABCs of behavior (antecedent-behavior-consequence) illustrates how behavior is elicited by the environment and how the consequences of behavior can affect its future occurrence. Three-term contingencies account for much of what scientists have discovered about the prediction and control of human behavior. An example of a three-term contingency is below. The previous example is one in which the antecedent has control over the behavior. This is referred to as respondent behavior, or behavior that is elicited by the antecedent stimuli. Let's look at an example of how this previous scenario could go differently if the antecedent were changed. Antecedent: Teacher shouts to class, "Time to switch!" In this example, the antecedent of shouting, "Time to switch!" caused a behavior that removed the student from the situation. Given the limited amount of information, the function of this behavior is unknown (Is he escaping the transition? Does he desire to obtain more time on his current activity?) but conducting a functional behavior assessment to determine the function is a necessary step to developing an intervention to address the behavior. One can see, however, that with the addition of a visual schedule the teacher was able to avoid this behavior. This is a type of antecedent intervention which can be found under the 'Application and Implications' tab. The tree-term contingency helps practitioners evaluate the behavior as a member of its environment. It can give insights into what immediately precedes and follows behavior in order to design interventions that address how a behavior is elicited or maintained.